On the Barrancas del Cobre aka Copper Canyon trip earlier this year I had an issue where the top radiator hose got to close the fan. The blades cut a notch in the hose and it started leaking. I built a plug out of layers of rescue tape and wrapped the area with more rescue tape. The fix held till I got home and replaced the hose with a new one. A couple of weeks ago I pulled in the driveway after getting gas and smelled coolant. I looked under the van and it was raining coolant. Put a couple of buckets under the van to collect it. After it stopped leaking I drained the rest. Got everything dried off and found that one of the hoses to the oil cooler had come in contact with the pulley on the bottom right of the engine. 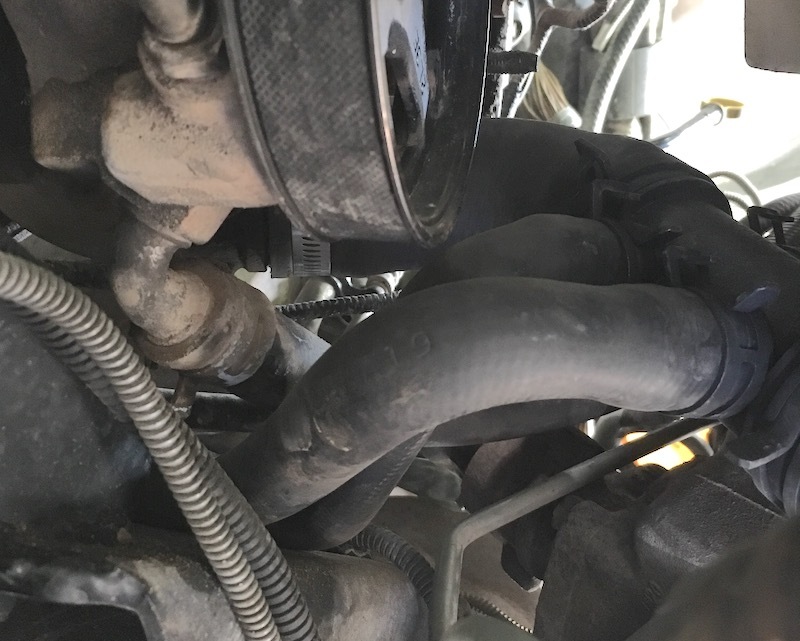 My 2002 service manual showed a part number for the oil cooler hoses. Unfortunately no one had them. 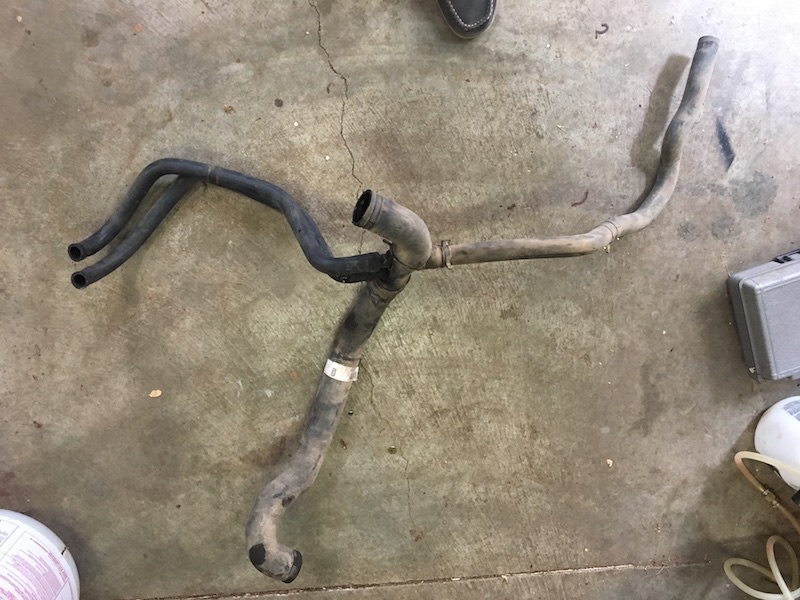 The only way to get them was to purchase a complete new hose setup, under a different part number, from the dealer, $105.00. This is a photo of the old hose assembly. The new one looks the same only cleaner. Here is what I think happened. The hose that goes to the coolant reservoir has a plastic clip that is suppose to hold it in place in the fan shroud. At some time in the past that clip pulled out allowing the entire hose assembly to drop pushing the oiler cooler hose into the pulley. With the clip in place the hose are close but not touching the pulley. Am going to add some tie wraps to the help support the weight of the hoses incase the clip pops out again. The good news is that I now have all new cooling hoses in the van. I thought about replacing that big “octopus” hose when I had everything apart to do my harmonic balancer and waterpump last year. I did the upper hose but not that lower one. Still regret not doing it, but at the the time I was rushed and it looked like a hassle to do. How much work was it? I just did mine as well, but used a $45 Gates unit from RockAuto with success. The install is fairly simple with the proper spring clamp compression tool. I replaced all the engine connections with Constant Torque clamps so I don't have to carry the special spring tool in the spares box. It was actually pretty easy. On my rig the radiator, coolant tank, and oil cooler hoses had stainless steel band clamps on the ends that just unscrew. The factory spring clamps do not need to be removed. There is also a clamp that holds the two oil cooler hoses to the body that is a bit difficult to get to, it is a long reach from the top. The hose assembly just lifts out with some tugging and pulling. The hardest part was getting the large hose at the engine to pull free. It was stuck on. Finely got it loose with a pick tool. 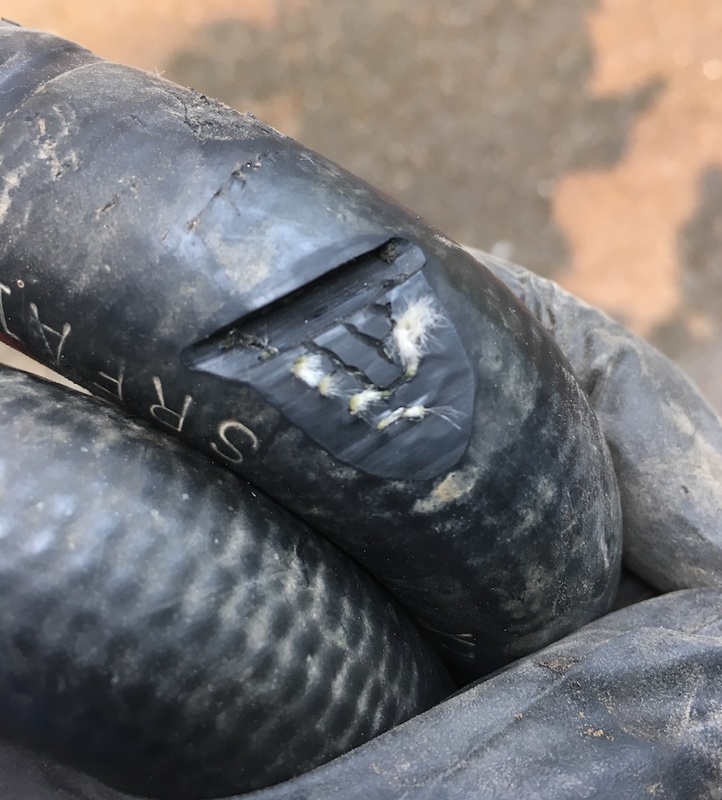 Having learned the hard way about proper hose and wire routing preventing bad events I'm sure we've all endured has become a top priority when I'm doing something on a vehicle these days. 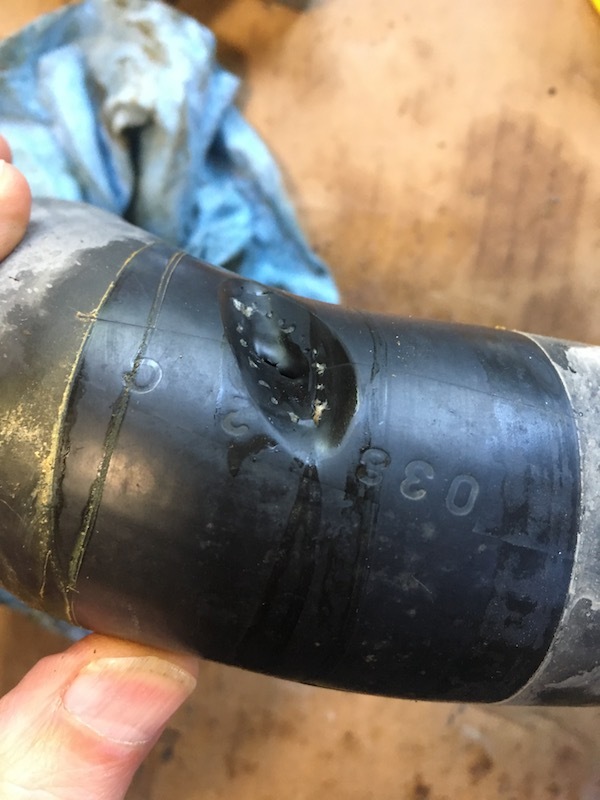 Its not always the easiest or least expensive way but the thought breaking down due what could be an easily preventable leak or short motivates me highly. Glad everyone in this thread didn't deal with too much crap but I'm impressed with the creativity of getting back on the road! Ive seen reference to this "rescue tape" on several different threads now, but your account (with supporting pic's) impresses the-hell-out-of-me...now see it as invaluable addition to my arsenal of gotta-haves. Ordered two rolls. 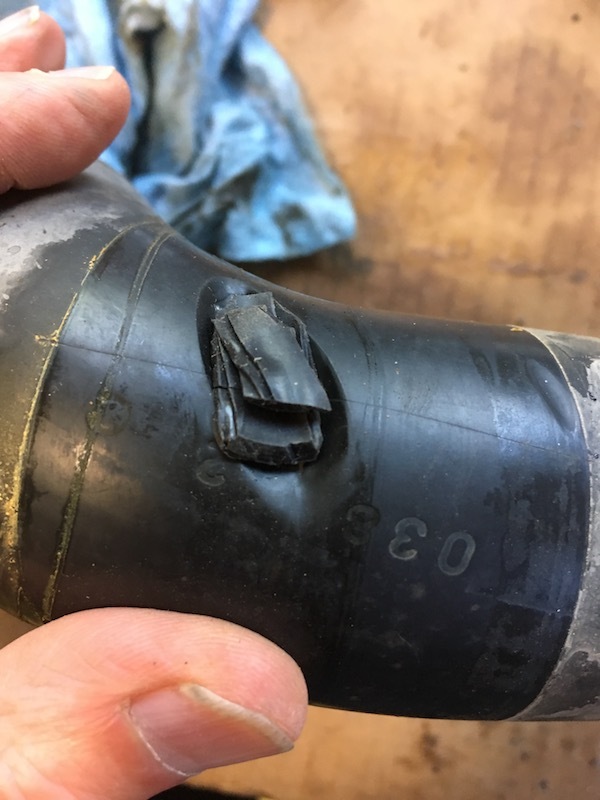 Great repair with the Rescue tape, I would never have thought to make a plug, despite carrying a roll on board. Rescue tape only adhears to itself when stretched. To make the plug I cut a bunch of one inch long pieces. Then stretched the firs and second pieces so they would bond. Then added the third piece and stretched the three pieces. Then four on up adding one piece at a time and stretching each time. Once it was thick enough to fill the gap top to bottom I trimmed and contoured it with scissors till it fit the gouge. Then wrapped the hose with more tape. The patch held for about 4,500 miles. Speaking of MacGyver, here's a tool I picked up years ago at a gun show. It's a great tool to make your own temporary or permanent clamps (single use clamps).